New developments near transport hubs in and around the inner city will no longer be required to include parking spaces as part of government reforms to planning laws. Including a parking space can add an additional $50,000 or more to the cost of a unit, with the changes designed to allow inner city residents who do not need or want a parking space from being forced to pay for one. Developers can still choose to include parking spaces, should market demand for them exist. Opposition to the plan prevented it from being extended to outer suburban locations, with critics worried that it would result in cars spilling over into streets and using up the limited amount of available on-street parking in the inner city. Five indicative bus routes have been identified which will run while the Epping to Chatswood Line is shut down during 2018 and 2019. The line is being upgraded as part of the North West Rail Link and will not operate for 7 months. During this time, additional bus services will operate to connect the T1 Northern Line and T1 North Shore Lines that are currently linked by rail between Epping to Chatswood. The NSW Government has called on private sector investors to show their interest in building and operating the 35km Maldon to Dombarton Rail Line. The freight line would connect Port Kembla in Wollongong to the Southern Sydney Freight Line, potentially removing freight trains from the T4 Illawarra Line that currently travel via Sutherland to reach Sydney from Port Kembla. This could mean a completely segregated freight and passenger rail network in metropolitan Sydney outside of the Western Line and Northern Line, much of which consists of 2 pairs of tracks and can better handle disruptions to passenger services caused by broken down freight trains, while also allowing more freight to operate during the busy commuter peak hour during which curfews are in place for freight trains on much of the passenger network. Construction on the Maldon to Dombarton freight line began in 1983 but was never completed due to an economic downturn and the forecast growth in coal traffic not eventuating. Plans to build high rise buildings close to the CBD by utilising the airspace above the rail line between Central and Redfern Stations looks set to be abandoned. The plan has proven to be too risky and too expensive. This made it unlikely that the private sector would be willing to bear the risk of the project, leaving the Government the risk burden. The plan, which would also contain a redevelopment of industrial areas on either side of the rail line near Redfern, had been compared to Barangaroo in size and scale. Finance reporter Alan Kohler wrote yesterday about how he believes clearways, the removal of on-street parking from major roads to improve traffic flow, are needed outside of peak hour as congestion problems now last well outside of peak hour; particularly so on weekends. In many cases a 4 lane road dedicates 2 lanes to parking, which restricts the maximum capacity by 50%. Rather than building expensive new roads, Mr Kohler opines that a better option would be to unlock this existing capacity. Mr Kohler is right about one thing, this is definitely a much cheaper way of improving road capacity than building new roads. Sydney’s WestConnex and Melbourne’s East-West Link alone are reported to cost $11.5bn and $18bn each, with State and Commonwealth Governments contributing a combined $9.3bn to the road projects so far. But removing on-street parking will only dramatically improve traffic flows if parking is the major bottleneck. In many cases, removing on-street parking can just see it replaced by intersections and bus stops as the bottleneck. A major road without additional turning lanes at intersections can see delays as through traffic is delayed by cars waiting to turn. However, because parking is not allowed near intersections, this effectively creates turning lanes. Thus, through traffic does not get stuck behind cars waiting to turn. This isn’t particularly problematic during peak hour as most traffic is through traffic headed towards a few major centres . However, outside of peak hour and on weekends in particular trips tend to be dispersed and this encourages more turning movements rather than through traffic. The effect of this is to enhance the benefit of clearways during peak hour but diminish it outside of it. The absence of bus bays can also cause through traffic to get stuck behind buses picking up or dropping off passengers at bus stops. With on-street parking, bus zones act as de facto bus bays, allowing buses to pull in and allow through traffic to continue undisrupted. However, unlike turning lanes, this is a bigger problem during peak hour when buses are more frequent. Extending clearways by removing on-street parking can improve traffic flows, but not all of the time. Care needs to be taken to ensure that doing so will actually improve traffic flows and not just replace one bottleneck with another. The best possible outcome is that these are considered on a case by case basis to improve traffic flows where it is possible rather than where it is not. The worst possible outcome would be that this does little to improve actual traffic flows but instead gives the impression that it will, encouraging extra road users into their cars and thus worsening traffic congestion. Charting Transport: Infrequently updated with a focus on Melbourne but generally covering all Australian capital cities. This blog uses charts and maps to display data relating to transport and urban planning. 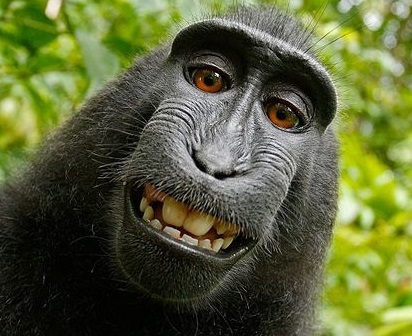 David Caldwell’s blog: Infrequently updated by David Caldwell, an engineer who has lived and worked in Sydney, London, and San Francisco. Posts tend to be very detailed and have often been about electronic ticketing and integrated fares. Human Transit: Usually updated weekly by transport consultant Jarrett Walker. The author currently resides in Portland, Oregon but up until recently lived in Sydney. Posts cover a variety of cities across the English speaking new world countries (USA, Canada, Australia, New Zealand) and have often been about network design. Love Your Trains: Usually updated once or twice a week. 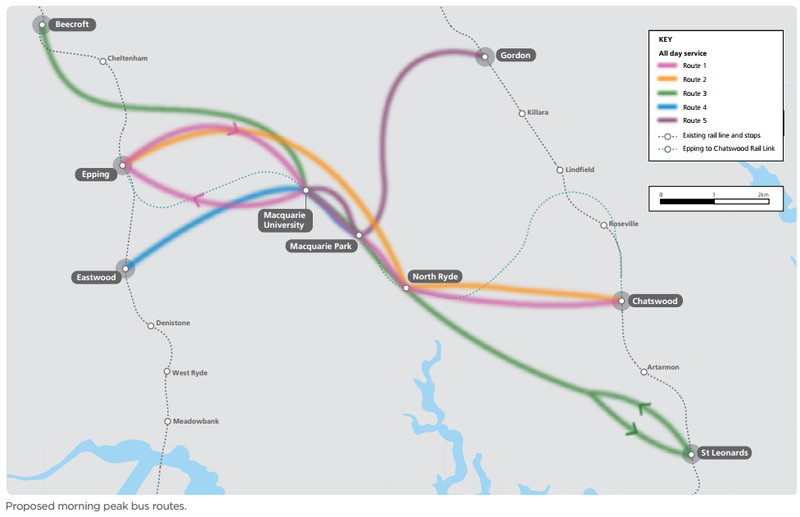 It is a relatively new blog that strives to give a positive view of the Sydney Trains network. Sydney Ferry Blog: Usually updated weekly by ferry planning consultant Robin Sandell. It is a relatively new blog with a strong focus on ferries. Posts are quite detailed and well written. Sydney’s Transport Sketchbook: Infrequently updated with posts that often alternate between flashbacks of past transport documents such as timetables, network maps, transport plans, etc or commentary on contemporary issues in the Sydney transport system. Posts can often be quite technical, covering aspects not covered elsewhere. The Urbanist: Updated daily with a focus on Melbourne, but also other Australian capital cities. As the title suggests, this blog focuses more on urban planning (plus a bit of architecture), but does delve into transport issues too. A large part of Sydney’s CBD will become a 40km per hour speed zone for cars by the end of September. The Roads Minister Duncan Gay said that “the new 40km per hour limit zone will operate in the area bound by Castlereagh Street to the east, Kent Street to the west and Hay Street to the south” and was due to be introduced by the Christmas shopping period at the end of the year. Large parts of the central Sydney area already have 40km per hour speed limits, including Millers Point, Woolloomooloo, Darlinghurst, Surry Hills, Redfern, Chippendale, Rosebery, Leichhardt, and Erskineville. Trains on the North West Rail Link (NWRL) will run every 4 minutes in peak and 10 minutes during off peak initially using a fleet of driverless 6 carriage trains. With platforms designed for 8 carriage trains, these can eventually be upgraded to longer trains. The line will initially have a capacity of about 17,280 passengers per hour, which could be doubled (34,560) if the maximum capacity of 30 trains per hour is reached. This maximum capacity of almost 35,000 passengers per hour is higher than the current 24,000 passengers per hour capacity for double deck trains, but will see fewer seated passengers per hour. The line will require a 6-7 month shutdown of the Epping to Chatswood Line in order for it to be converted to operate on the new Sydney Rapid Transit system. This will occur in early 2019 and possibly also late 2018. Sydney Trains and NSW TrainLink employees have agreed to an enterprise agreement in which they have given up conditions which protected them from job redundancies in exchange for a higher pay in the agreement. Previously rail employees could not be retrenched if their positions were made redundant, a working condition that had become increasingly rare. The agreement was agreed to by two thirds of employees and according to Transport for NSW the state will save $20m per year. The Sydney Morning Herald reports that 200 rail employees are currently employed despite having their positions being made redundant. The organisation responsible for managing these employees, INS, spends a reported $8m in administrative costs each year. Employees will be able to be retrenched after 12 months if no job is found for them during that time. 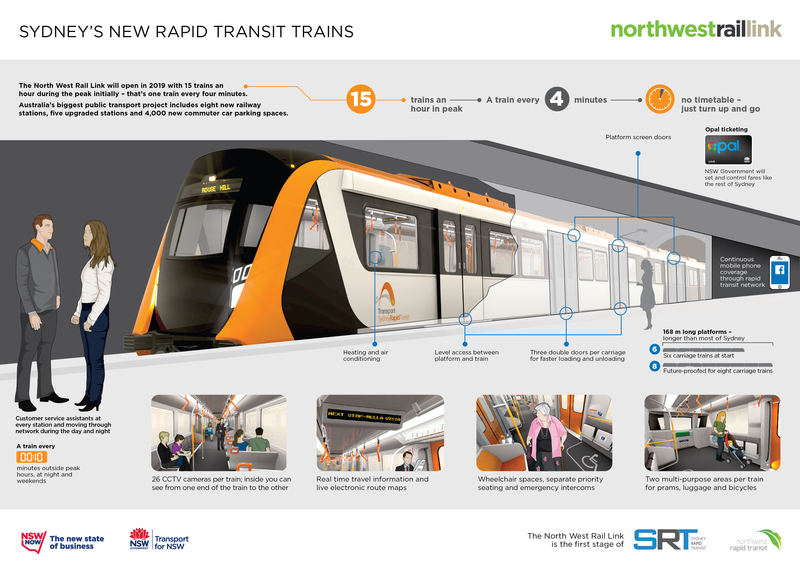 Trains on the North West Rail Link (NWRL), the first part of a future Sydney Rapid Transit network, will run every 4 minutes during peak hour as part of the $3.7bn operations contract signed by the government. This is more frequent than the originally promised 5 minute frequencies previously committed to by the government, while off peak frequencies will remain at 10 minutes. Trains on the $8.3bn railway will initially have 6 cars, though platforms will be built to handle 8 car trains. Maximum capacity on the line is 30 trains per hour, twice the planned 15 trains an hour required for 4 minute frequencies. The Sydney Morning Herald reports that 15 trains per hour will allow for 17,280 passengers per hour, with 5,500 to 6,000 of those seated. Assuming that the maximum of 30 trains per hour is reached, this is two thirds the seated capacity of Sydney’s current double deck trains (which are too large to fit through the tunnels being built for the NWRL) but almost one and a half times the total overall capacity of double deck trains. This will partly be achieved by having less seating, with both longitudinal and transverse seating shown on artists impressions. Unlike most of the Sydney Trains rolling stock, the transverse seating shown is not reversible. Trains will be driverless, the first in Australia to do so. This removes the need to reserve the front and back of the train for drivers and/or guards, allowing passengers to view straight ahead or behind for the first time. They will also benefit from level boarding with no gaps between platform and train, as well as make use of screen doors at platforms. Space will be available on trains for pram, luggage, and bicycle storage. Tunneling on the new rail line began last week, 4 months ahead of schedule. The line is expected to open in 2019, initially terminating at Chatswood. 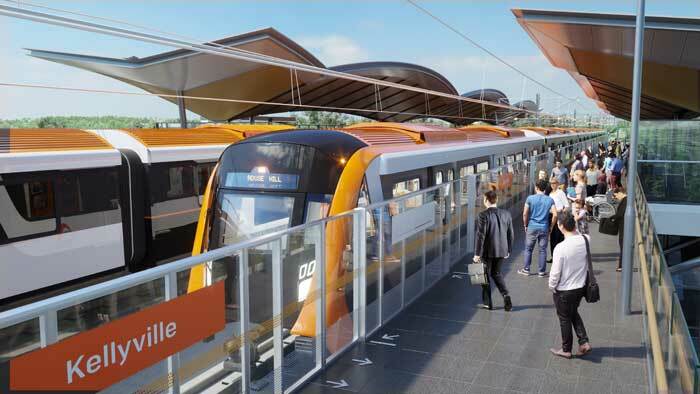 An under the Harbour rail crossing would form the second phase of the Sydney Rapid Transit network, connecting it to the CBD, while a third phase would convert the Bankstown Line to single deck metro operation and extend the network further to Bankstown. The second phase is conditional on the money raised from the 49% sale of the state’s “poles and wires” electricity distribution network. 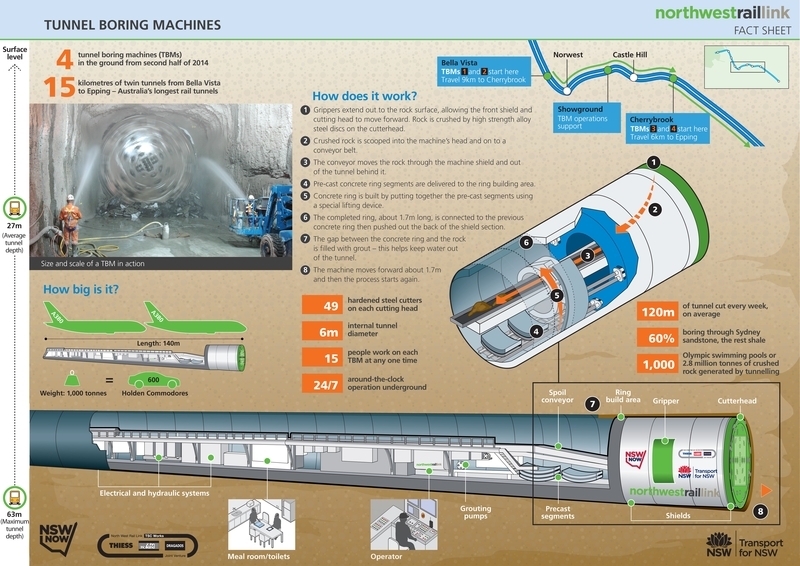 The first of 4 tunnel boring machines (TBM) began work on the 15km twin tunnels that will form the core of the 23km North West Rail Link. Tunneling was expected to begin by the end of this year. 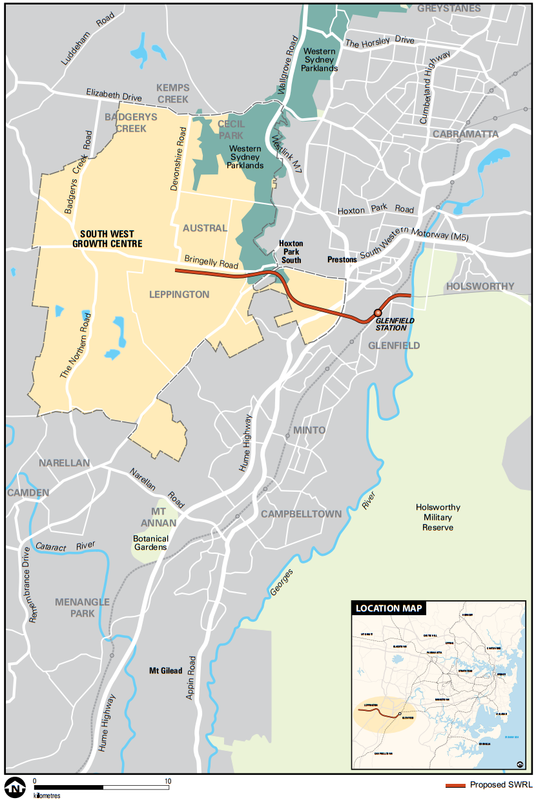 The current TBM, along with a second when it is ready, are beginning from Bella Vista and will cut a pair of 9km tunnels through to Cherrybrook, where a second pair of TBMs will cut another pair of 6km tunnels to Epping. Tunneling is likely to take about 2 years, with station and tunnel fit outs to take an additional 2 years, and a final year to bring the line to operational rediness in time for a 2019 opening. An agreement with Transfield to manage cleaning services for Sydney Trains has been cancelled 2 years into the 4 year contract. The cleaning will still be contracted out, but the management of the private contractors has been brought in house within Sydney Trains. 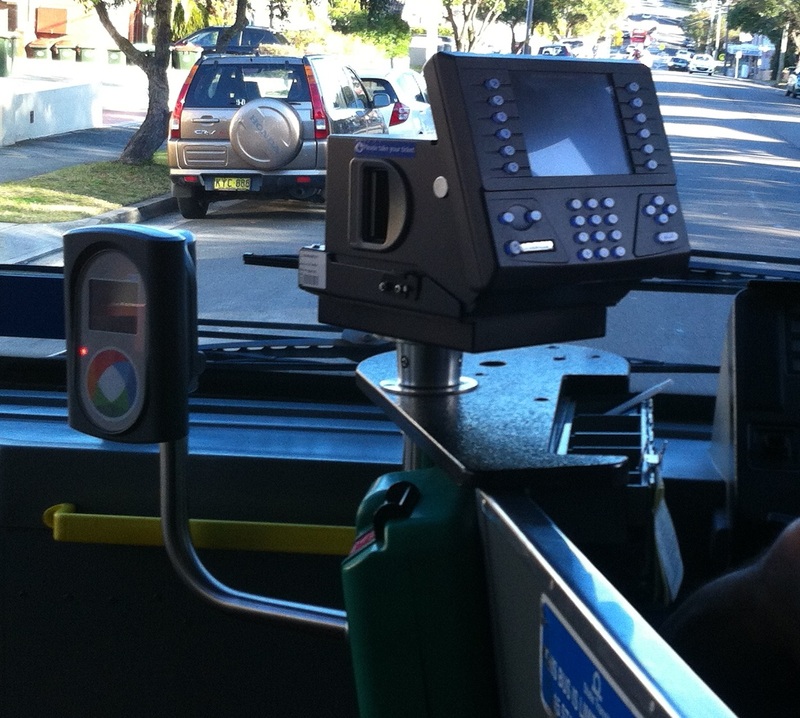 Opal readers have been enabled on buses in Sydney’s Inner West as well as in the lower Hunter region. This brings the number of Opal enabled buses up to 3,290. There are 5,000 buses in NSW that are on track to be Opal enabled by the end of the year. 850,000 Opal cards have been issued, a large increase on the 500,000 Opal cards that had been issued at the start of August. Granville Station’s bus interchange upgrade has been completed, along with an increase in 40 car spaces for commuter parking. Construction on an additional 20 car parking spaces is also planned to commence soon. The South West Rail Link has been completed a year ahead of schedule and $300m under budget. The line was originally announced in 2005, with a $688m budget and an expected opening date of 2012. However, by the time it had been scheduled to be completed in 2012, the budget had blown out to $2.1bn and the opening date pushed back to 2016. The line will be opened early next year, with January being rumoured as the planned date. The new line’s timetables and operating patterns will be worked out between now and when it is opened. NSW Government changes to the sale of Pensioner Excursion Tickets (PET) have been described as “very difficult” and “unnecessary” following the discontinuation of their sale on the government operated State Transit buses on 1 June this year. 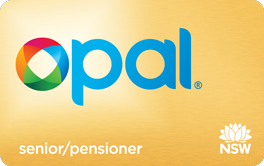 As a result of the changes, pensioners must now pre-purchase a PET prior to boarding a State Transit bus, as the pensioner Opal card has not yet been released. The Transport Minister Gladys Berejiklian has dismissed these descriptions, arguing that the changes will affect only a very small number of pensioners. The issue stems from the consoles used on board buses to both read and sell magnetic stripe tickets. These were removed from State Transit buses once Opal readers were activated, replaced with new consoles that had to simultaneously accept both the new Opal cards and the old magnetic stripe tickets. A side effect of this appears to be that they can no longer sell PETs onboard the bus. Private buses never adopted magnetic stripe ticket readers and continue to sell PETs onboard. The first 2 bus routes to trial Opal, the 594/594H and the 333, were unaffected by this. The former was privately operated and so continues to sell PETs onboard, while the latter was prepay only and never sold PETs in the first place. It was not until the Opal bus trial expanded to other State Transit buses from 28 April that it began to become an issue. This presented a choice of which technology to roll out first: pensioner Opal cards or Opal readers on State Transit buses. Rolling out pensioner Opal cards before the entire network is Opal enabled risked having pensioners with an Opal card board a non-Opal enabled bus expecting to be able to use their Opal card. While this was unavoidable for regular Opal card users, it is even more problematic for pensioners who have always been able to travel on a single ticket. Waiting for the Opal rollout to be complete before releasing pensioner Opal cards risked having pensioners being unable to purchase a PET onboard an Opal enabled bus. This was the option taken by the government, requiring pensioners to pre-purchase their tickets at a train station or retailer. In fact the government went beyond that, ending the sale of PETs on all State Transit buses from 1 June 2014, rather than just the Opal enabled ones, in order to reduce confusion. A different perspective is that had the Government gone with the first option, it would now be facing criticism from Opal card holding pensioners boarding non-Opal enabled buses and discovering they have to pay an extra fare. Until all 5,000 buses in NSW have Opal readers installed, an Opal card will not provide the coverage that a PET does. Yet another perspective is that of the Transport Minister: this has all been blown out of proportion. PETs are still being sold, just not on State Transit buses. Those residing near a retailer will face few problem, as will those in areas serviced by private buses or any non-bus public transport. For those remaining, if they obtained a second PET for the next day they needed to travel, and then used any subsequent trip to purchase an additional PET from a retailer, they would always have a PET ready to go just like many Travel Ten holders do. Failing that, there’s always the option of going back to just describing it as unnecessary and very difficult.